Marcus Kenneth Glass’s Sunderland Synagogue of 1928 is under indirect threat from owners who want to re-develop the site. This is particularly worrying because it is the last surviving synagogue by this prolific and largely unsung architect. Having seen its sister building, Clapton Federation Synagogue demolished in July 2006 ahead of a possible listing proposal, Sunderland Synagogue remains in a perilous position – empty, and with no new use despite its Grade II status. Externally, it is a remarkably complete building, designed in red-brick with attractive artificial stone dressing that was typical of Glass’s exuberant language in which he fused elements of deco, Islamic and Byzantine decoration to achieve a colourful and distinctive whole. Glass had a predilection for colourful façades and his red and yellow ablaq striped brickwork, and arcaded porches suggest clear parallels with the deco cinema buildings of the time, buildings for which Glass was known to have affection. Inside, the synagogue is again highly decorative, demonstrating Glass’s confidence in unifying disparate patterns, colours and design. 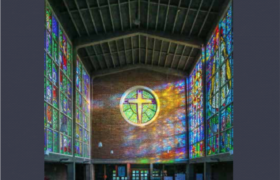 The stained glass, by an unknown firm, is the best to be found in any of his buildings, especially the large Magen David roundels at east and west. Rated by Pevsner as “rigorous and decorative”, the synagogue was listed in 1999 to stop a possible demolition, but its future remains in the balance. 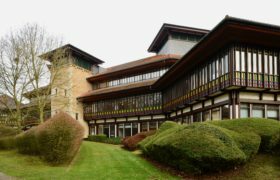 The listing of it prompted a reassessment of Glass’s work and the building is to feature in a forthcoming book ‘Jewish Heritage in England’, by Dr Sharman Kadish, director of Jewish Heritage UK. The Independent recently picked up on the plight of the UK’s Jewish architecture in an article by Cahal Milmo and mentioned the building along with many others that are under threat. Dr Kadish has seen two synagogues demolished since the book went to print, Clapton Federation and an extremely rare International style synagogue, the Birmingham Progressive, designed by Shell Mex House architect Ernest Joseph in 1938. Sunderland Synagogue was closed for worship in March 2006, reflecting the dissipation of the once strong Jewish community in Sunderland. The Society, together with Jewish Heritage and the owners, hopes to find an appropriate future for this charming and important building.